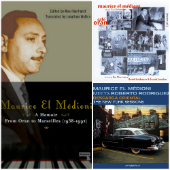 Maurice El Medioni - "# Limited Edition: Book + 2 CDs"
"Descarga Oriental", "Cafe Oran" CDs & "A Memoir: From Oran to Marseilles"
Maurice El Medioni's autobiography is now out. This book contains his original handwritten memoirs - how he has developed his unique 'pianorientale' style; the subsequent golden years of nightlife in Oran, the 'Paris of the South', the horrific years of bloodshed that followed in the Algerian war of Independence, his exile from Algeria and his later life in France. Together with it you can now buy both of his albums released on Piranha Records - "Descarga Oriental" & "Cafe Oran", on a special price! 1. Please look up the tracks on each individual CD site!